In a perfect world, I would eat a wonderful, sustainable, 100-mile diet. But since I refuse to subsist entirely on root vegetables and preserves all winter, that doesn't really happen, and we enjoy product from around the world all winter long. But come summer, I really want to do my best to enjoy the fantastic local produce grown (almost literally) in my own backyard (my own backyard having a massive patch of squash, which choked out everything else...maybe year two of gardening will be a bit more varied, hehe). In the meantime, given my gardening failures, I get a local organic produce delivery from Bryson Farms, which isn't quite in my own backyard (Dekok, Acorn Creek and Shouldice are all closer), but I love the delivery aspect. Farmers' markets are pretty awesome in theory, but I have a hard time scrambling everyone together to get going on a Saturday morning, and then the markets themselves are pretty crowded (not so awesome with an active two year old), and I never have enough small change. So my lack of motivation/organization benefits to the extreme from nice farmers who are willing to bring their wares right to my front step. You pay a premium, but I'm totally loving the variety of vegetables that we've been enjoying. 1. Slice the tomatoes with a serrated knife and arrange on a platter. I find it's easiest if you start with the largest tomatoes, and then work the smaller ones in and around. Mix up the colours and sizes. 2. 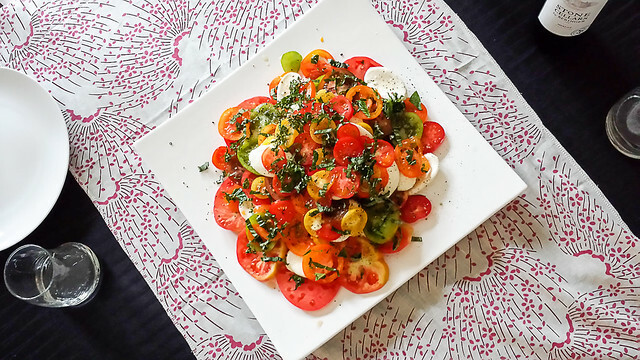 While slicing the tomatoes, layer slices of bocconcini. As you build up the layers of tomato/bocconcini, periodically add a light sprinkle of salt and pepper. 3. When you're done, sprinkle the basil over top. I recommend keeping the dressing separate if you are in doubt of whether the salad will be finished in one sitting (the vinegar will make the tomatoes mushy). 1. Combine the salt, pepper, shallot and balsamic; whisk together. Add in the mustard and whisk again. 2. Slowly drizzle in the olive oil while whisking until desired consistency/flavour is reached (usually somewhere between 2-3x the amount of vinegar that was used, depending on how acidic you like your dressing). 3. Drizzle over anything and everything. That's it. It's so yummy and simple and delicious. And I had some of the leftover salad stuffed in a wrap with some turkey breast and it was also amazing.